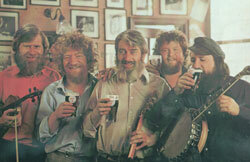 Music is a huge part of Dublin's History and traditional Irish music has a home right here in O'Donoghue's famous bar. A favourite of Christy Moore and the Dubliners amongst its illustrious past ,It has been an attraction not only for tourists from all over the world but is also a favourite haunt of local Dubliners, who for seven nights a week come to The bar for the real Irish Music Experience. The whole bar is adorned with drawings and and photographs of some of Irelands finest musicians young and old alike who have all played their part in adding to what has become the unique musical heritage of Dublin at O'Donoghue's. www.ceolas.org Great archive for finding out about Celtic music. Includes profiles of artists, reviews and sound samples. www.irish-mail.net Irish Music Magazine. Very Informative music magazine. www.azirishmusic.com Arizona Irish music society news listings and a wealth of information on a huge network of artists and music makers in the states. www.irishvoice.com Online Guide and news for New York's Irish-American community features weekly news, editorials, sports highlights, plus arts and entertainment reviews. www.irishchat.net Chat about music culture and all things Irish a great place to meet and tell people about your stay at O'Donoghue's. www.celtictv.com Watch live performances, listen to sound clips, access the discussion forum or chat room, and find links to additional band information. www.dararecords.com New York distributor of some of Ireland's finest Celtic music acts. New releases, featured artists. Who kick started the crossover of traditional Irish Music in the mid-sixties. Regular performers include Tom Foley, Joe McHugh, Joe Foley, Maria O'Connell. Who go to make up a section of Rattlin Strings great favourites of Dubliner music lovers. At The bar you can purchase CD's by the artists, Buy T-Shirts, Postcards and O'Donoghue's posters.